A widespread, relatively small species, very similar to the generally larger Garden bumblebee (Bombus hortorum). Despite the English name it is not restricted to heathland (although it does show a preference) and can be found in a wide range of habitats. Though generally a white-tailed species, an orange-tailed form occurs on Shetland and in the Western Isles, which can be mistaken for the Early bumblebee (Bombus pratorum). All castes have a yellow-black-yellow thorax, with the final thoracic band merging with a yellow band at the front of the abdomen. Males also have a very bright yellow face. Heath bumblebees. Photo credits: Nick Owens (left), Peter Barber (right). 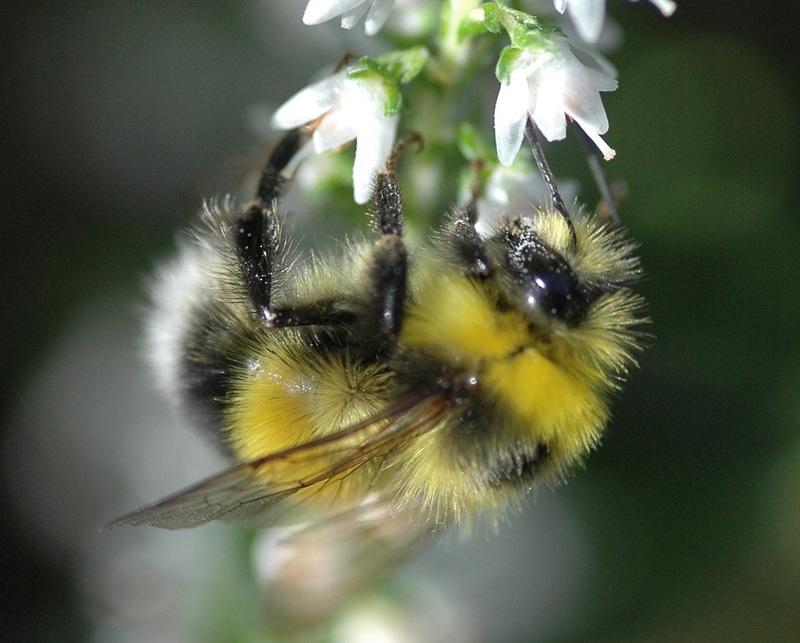 Although similar to the larger Garden bumblebee and the scarce Ruderal bumblebee (Bombus ruderatus), the Heath bumblebee has a small round face, only as long as it is wide, whereas the larger two species both have faces much longer than they are wide. The Heath bumblebee also tends to have a shaggier, unkempt appearance, but the species must be seen together for this to be appreciated. Barbut’s cuckoo bumblebee (Bombus barbutellus), which parasitizes the Garden bumblebee, can look similar, and also has a short face, however the lack of pollen baskets differentiates females. The genital capsule is useful to check the ID of males, particularly of worn specimens.